Mum to be Hypnobirthing Classes are designed to remove the barriers of couples who wish to attend classes that do not wish to have these in the privacy of there own home. Session 1-3 is attended by the mum to be alone (birth partners also welcome to attend session 1 to learn the theory behind The Wise Hippo. Session 4 both mum to be and one other birth partner of choice to attend. Sessions are 7pm-10pm on a Tuesday night with a 6.30pm arrival for social time. Mum to be aims to reduce the need for babysitters when mums to be are grouping their families. Tea, Coffee and biscuits will be available. Investment for these sessions is £197 per mum to be compared to £297 for couples classes at the same venue. Maximum of 4 mums to be per group. 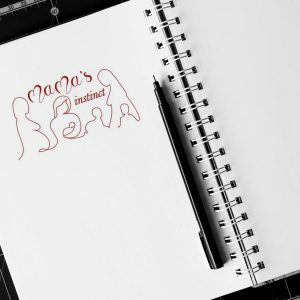 In mum to be session 1, we explore the theory behind the mind and body connection. You and your Birth Partner will lay a great foundation upon which to grow in confidence. Bust any negative beliefs you may have about birth. Get comfortable with what we mean by hypnosis. There are no swinging watches and getting you to cluck like a chicken we promise. Familiarise yourself with the physiology of birth so you can let go of worrying about how all of that stuff works. We bet you will be fascinated. Understand how the mind interprets PAIN… so that you can learn how to manage and control it. Take charge of your thoughts so that you can enjoy your pregnancy and look forward to your birth, rather than feeling anxious and worried when it is a time for joy and happiness. In mum to be session 2, we explore active relaxation. This session is very very experiential so you learn the techniques and tools for life. Learn how to become an expert in relaxation so that you can feel calm, relaxed and in control in the lead up to and during your baby’s birth. Discover how to use your breath during labour to enable the birth cocktail of hormones to flow in just the right way. Learn how to distract your mind away from your body so that you can distance yourself from any pain. Feel confident in the fact that your partner is learning how to use all of these tools and techniques with you, so that they can help you use them on the day. In mum to be session 3, we explore prenatal bonding, physical preparations for birth and practical ones also. It’s your birth so take the time to consider what is important to you. Where do you want to birth? What do you want your birthing environment to be like? Who do you want to be with you? How do you want to get labour started? These are the kinds of questions you will be exploring, so that you can plan for the birth you want. Experience a powerful FEAR RELEASE session so that you can look forward to your baby’s birth. Mum to be Hypnobirthing Session 4 you can bring up to one birth partner this can be anyone you choose to bring for birth support. This session starts with learning the soothing strokes which you can see three couples practising from one of my other couples classes venue. The focus is on your Birth Partner so that they fully understand how you want them to support you on the day. Enjoy Soothing Strokes an incredibly simple form of light massage to stimulate your body’s natural pain relief. Use your B.R.A.I.N.S. to make sure that you have a structured way to ask questions if required. 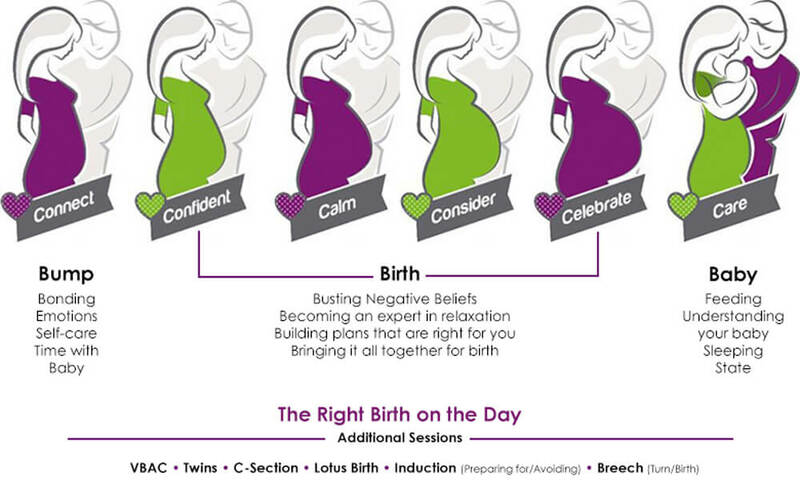 Explore the best Birthing Positions to support an easier more comfortable birth. Learn birth humming to help avoid unnecessarily forced pushing for birth. Walk through your labour and birth from it getting started to holding your baby in your arms and how what you have been learning fits in with that. Why not treat yourself to the whole suite of programmes – that’s the Prenatal Parenting Programme, Birthing Programme and the Early Parenting Programme combined into one complete course, ensuring that you have me by your side for Bump, Birth and Baby. Every Mum to be will have individual circumstances so to allow for this I also offer any of the right birth on the day additional packages to mums to be as a 1:2:1 session after you have completed the 4 birthing programme sessions at a top-up fee of £75. This session is held in your own home. You gain access to the additional electronic handbook, MP3 if the session has one, watch additional videos tailored for the session and are able to ask as many questions face to face. If you would like to pay the £75 deposits and remainder 4 weeks before the start of the session to secure your place type DEPOSIT at ticket checkout. Contact Bex today for a clarity call to discuss your individual circumstances. Welcome, I am Bex! I am an antenatal and parenting coach who uses an holistic approach to guide and provide information from preconception to your child leaving home. So that you can make informed decisions which are right for you and your family. I am highly experienced at coach can tailor your experience to met your individual needs. I has over 30 years experience working with families and children. 14 years experience of Coaching and Training Organisations, Professionals and Parents from foundation level to post graduate level of formal qualifications. I can cover all areas up to an hours travel travel from Gravesend in Kent. Finalist in Kent Women in Business Professional Achievement Award 2019!